Make your most-used closet the best it can be! It often goes unnoticed when you're considering revamping your closet systems, yet it's one of the most used closets in your home. The coat closet may be among the smallest in the house, but it's a key spot for organization. The Closet Shop can help you design a functional coat closet that will eliminate wasted space with separate hanging space for short and long coats and other outer wear. Shelf cubbies for hats, gloves, shoes and scarves will make it much easier to find what you need, when you need it. 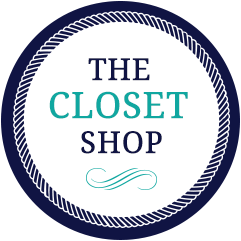 As always, The Closet Shop provides lifetime warranties on all its products.